Guest Starring The World-Renowned Artist Charles R. Knight, Chief Red Cloud & Hundreds of His Indian Braves, the Gun-Totin’ & Gamblin’ Professor John Bell Hatcher, Colossal & Stupefying Dinosauria of the New World, and Featuring Special Appearances by The Cardiff Giant, P.T. Barnum, Buffalo Bill Cody, Ulysses S. Grant, Alexander Graham Bell, and A Plentiful Supporting Cast of Rogues & Gallants from The Eastern Scientific Establishment and The Old West. From the early Triassic and the first dinosaurs to today, the new golden age of comics and original graphic novels, the world has never seen a book like this. 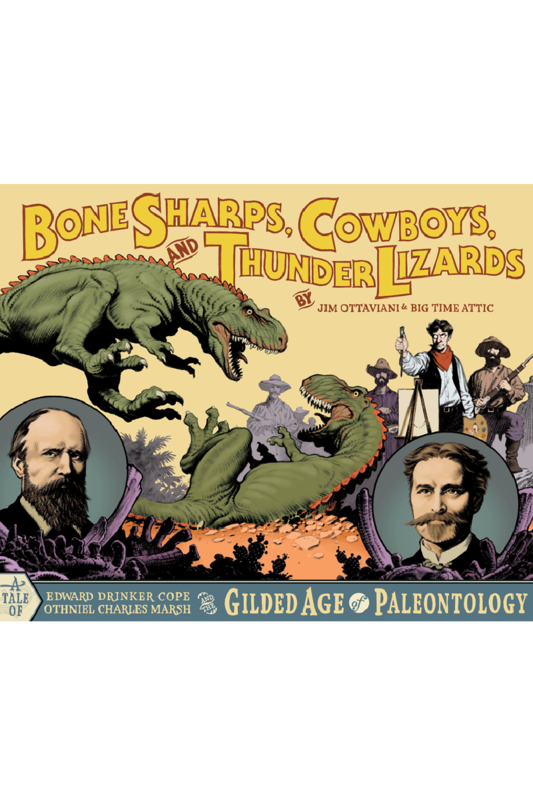 Bone Sharps, Cowboys, and Thunder Lizards tells the story of Edward Drinker Cope and Othniel Charles Marsh, two scientists who found and fought for the fossil treasures discovered in the American West in the late 1800s. It also introduces the young artist Charles R. Knight who almost single-handedly brought dinosaurs back to life for an awestruck public. Put them together and you get a rich blend of history, adventure, science, and art. Bone Sharps, Cowboys, and Thunder Lizards is a tale of greed and imagination, discovery and loss. And, not that it matters all that much, but just about everything you’ll read in it is true! About the storytellers: Fresh from award winning work on Top Ten and Smax from America’s Best Comics , Big Time Attic’s Zander Cannon and his colleagues Shadi Petosky and Kevin Cannon bring their considerable talents to bear on this unique story. The presentation — rich sepia tones on antiqued paper and a cover illustration by renowned dinosaur artist Mark Schultz — complements the story and makes the book a handsome blend of the old and the new.